A Challenge for you! 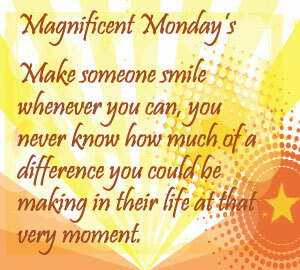 Make Monday’s Magnificent by acting with kindness to yourself and others. Monday’s have always been hard and pretty miserable for me; it’s just the day of the week that I always hated, even if I had the day off. I want to change that! This Monday’s idea: Compliment someone and mean it. What did you do today to make someone else’s’ life a little better?